In retirement, you don't have to rise at the crack of dawn, fight traffic, and report to a job that stresses you out. So you might think that retirement would present opportunities to improve your overall health. But researchers say that often isn't the case. Writing in the Journal of the American Board of Family Medicine, health researchers at West Virginia University attempted to compare the rate of living a healthy lifestyle among retired people to those who were still reporting to work each day. The researchers at the West Virginia University School of Medicine’s Department of Family Medicine looked at whether retired late-middle-aged adults have a different level of healthy lifestyle and metabolic risk factors, including diet, exercise, smoking, weight, glucose levels, blood pressure, and cholesterol, when compared to adults of the same age who are still working. Taking advantage of the free time? "We know that full-time work keeps people busy and often unable to find the time for healthy eating and exercise,” said Dr. Dana King, who led the study. “We decided to investigate whether people who were retiring took advantage of their additional free time to lead a healthier lifestyle." 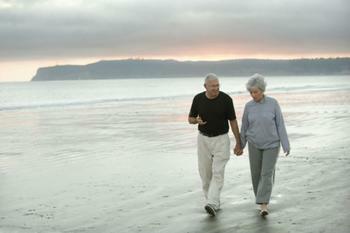 Retirement offers many opportunities to improve your health. You have more time to exercise and to plan a healthy meal menu. But the researchers found that to be the exception, not the rule. They said chronic disease, the use of several medications, and a busier than expected schedule in retirement meant many people were not using their life change to improve their health. In fact, the researchers concluded that retirement doesn't necessarily have a strong association with improvements in healthy lifestyle habits or other cardiovascular risk factors. It found that retired Baby Boomers more often than not are obese, have elevated blood pressure, and other health complications. They are no more likely than anyone else to be eating a healthy diet. It's true that physical activity increased after retirement, but researchers say that, in and of itself, is not enough to make up for other unhealthy behaviors.